In Zunyi city, Guizhou province of south China, a 7,200-meter-long man-made canal with 2,200 meters of branches winds deep within the mountains. The ditch, which took 36 years to build, runs through three mountains and passes through more than 10 village communities. The canal brought irrigation to Caowangba community and was named as “Dafa Canal” by villagers to highlight the efforts of Huang Dafa, former secretary of the party branch of Caowangba community. .
Villagers of the community suffered from water shortage for generations. The two-hour walk along rugged mountain roads made irrigation extremely difficult and only a few crops could survive. In drought years, crops could only support the villagers for no more than five months. Meanwhile, only several miles away, Yebiao village had adequate water supply. So finding a way to transport the water through Lingbao Mountain, which lies between the two, was thought to be a solution. After being elected as the secretary in 1959, Huang and the villagers planned to dig a waterway on the slopes. But things did not go well due to karst mountains, lack of technical skills and divergent opinions among villagers. So the project, which continued on and off for more than a dozen of years, seemed to fizzle. But Huang did not give up and he felt responsible to complete the project. 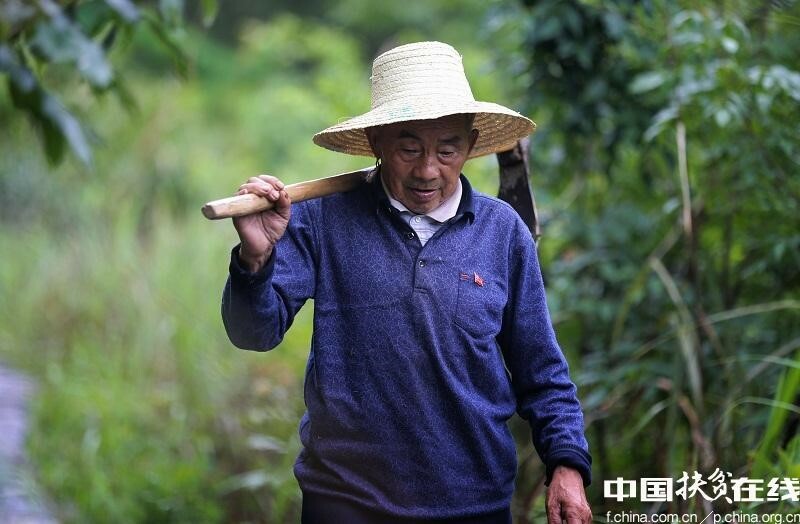 In 1989, in order to know more about building irrigation system, he applied to work in Fengxiang district, where he managed to acquire much valuable experience. The next year, a severe drought struck Caowangba with no precipitation for more than 100 days, exacerbating water shortage. It was in that year that Huang decided to mobilize his fellow villagers and restart the canal project. In the spring of 1992, construction of the waterway finally began. Poor logistical conditions meant that materials like cement had to be carried manually. The most risky part of the construction past through the “Caer Rock,” which lies on the top of a 300- meter-high cliff. But Huang persuaded villagers to overcome their fear. In May 1995, after three years of hard work, water finally flew into the community after the completion of a 7.2-kilometer main water channel along with 2.2 kilometers of its branches. It should be noted that except for a minor injury, villagers involved in this project were safe during the construction period. These channels transport water to places near villagers’ home and made rice planting possible. At the same year, the village got access to electricity and a new road was built. Fast forward to 2016, the per capita net income reported by the local government was about 6,500 yuan (US$980), far higher than China’s 2,300 yuan (US$350) poverty line. Last year, it was estimated that the area covered by paddies has tripled from 40 to 120 acres. Furthermore, agriculture production became more diversified with the planting of walnuts, pomelo and pepper, as well as livestock raising. Although Huang is in his eighties, he still continues to check on the canals.